10 Comments This post may contain affiliate links. Girl Scout Cookies are basically the most delicious cookies on earth, ESPECIALLY the Thin Mints. Chocolate and mint is my favorite flavor combo, which probably explains why I think these cookies are just SO GOOD. However, each year, I have to (forcefully) stop myself from diving face-first into a box of Girl Scout Thin Mints because of the not-so-great ingredients, the high carb content, and because they are far from allergy-friendly. 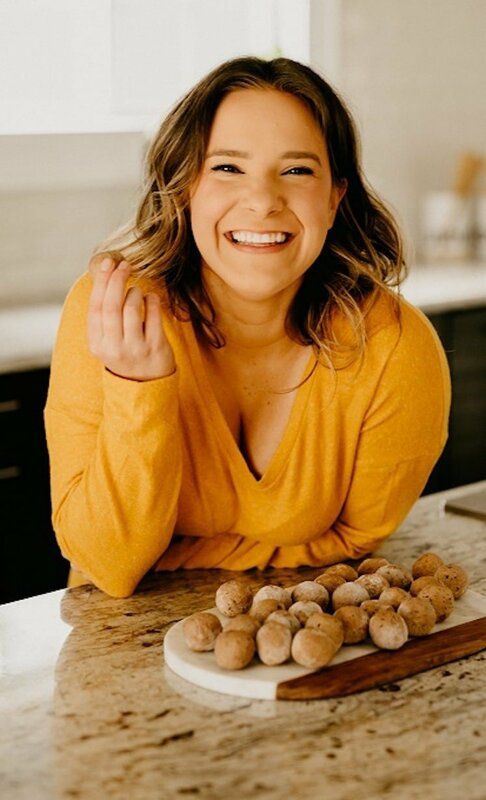 With that in mind, I knew I needed to come up with a keto- and allergy-friendly alternative! 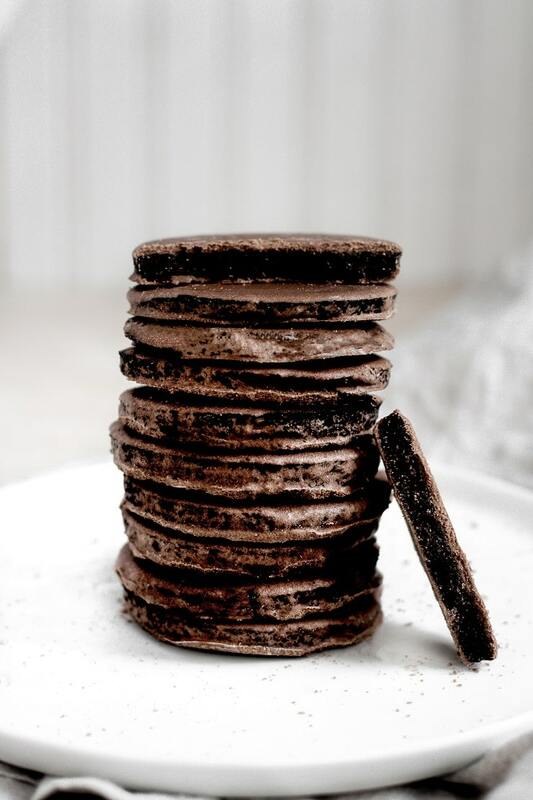 Low-Carb/Keto: Only 1.5 grams of net carbs per cookie in these Thin Mints versus over 5 grams of carbs in the traditional version of the cookie. 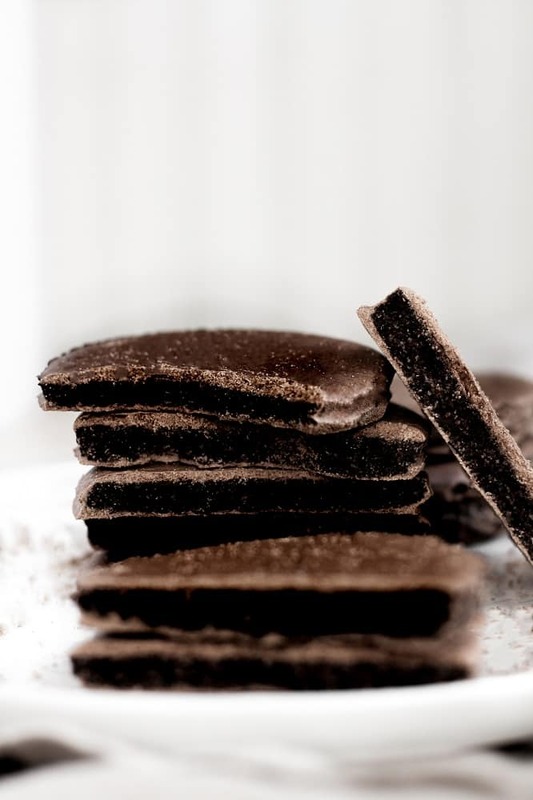 Paleo: These Thin Mints are free from grains, gluten, soy, and dairy. Dairy-Free: Coconut oil is used in this recipe in place of cream, milk, and butter. Egg-Free: This recipe can be made egg-free by using ground flax seeds, a fiber-rich, vegan alternative to eggs! 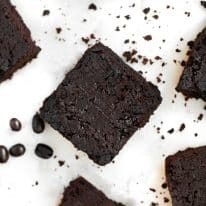 Gluten-Free/Grain-Free: This recipe uses almond flour, a grain- and gluten-free baking ingredient. Vegetarian/Vegan: In addition to these cookies being low-carb and paleo-compliant, they are also vegetarian/vegan as they are free from animal products. 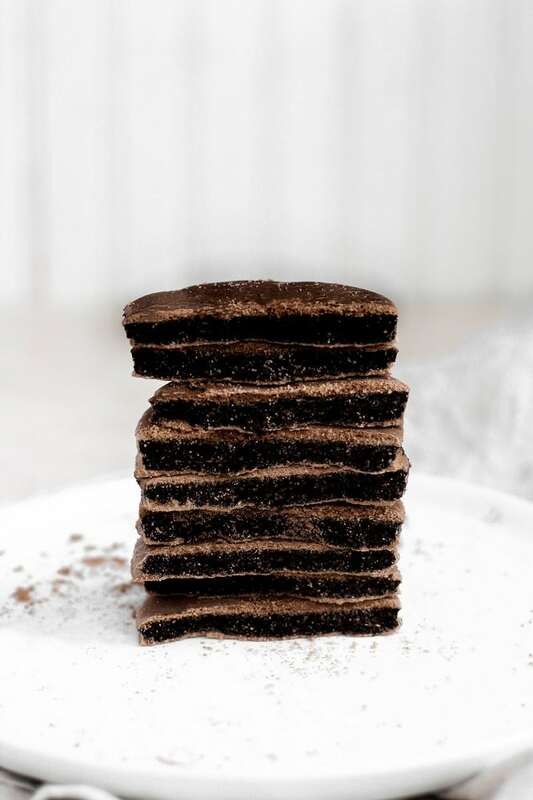 With only 1.5g net carbs per serving, these Thin Mints are a perfect keto- and allergy-friendly dessert that everyone can enjoy! 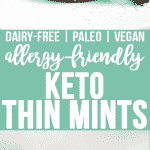 This keto thin mints recipe is keto, low-carb, paleo, dairy-free, egg-free, gluten-free, grain-free, vegetarian, vegan, and refined-sugar-free. 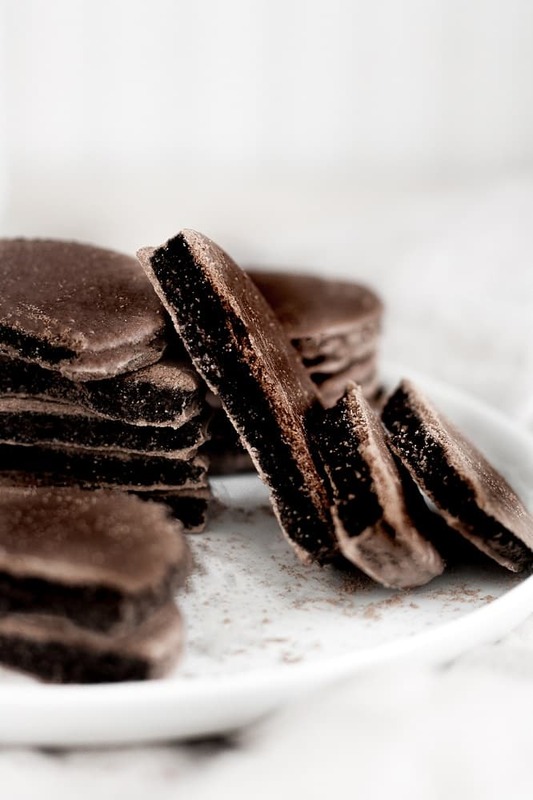 These Keto Thin Mints are a perfect way to curb your craving for a chocolate baked good! These cookies are keto, low-carb, paleo, dairy-free, egg-free, gluten-free, grain-free, vegetarian, vegan, refined-sugar-free, and only 1.5g net carbs per serving! Preheat oven to 325 degrees and line two baking sheets with parchment paper. (For egg-free/vegan) To a small bowl, add flax seeds and water. Whisk together until fully incorporated. Set aside to set for at least 5 minutes. To a mixing bowl, add dry ingredients and whisk together. Melt coconut oil in microwave until liquid, about 30 seconds. To dry ingredients, add melted coconut oil, flax mixture OR egg, peppermint extract, and vanilla extract. Mix together until well-combined. Roll dough into ball and transfer bowl of dough to refrigerator to chill for 10 minutes. Between two pieces of parchment paper, place ball of chilled dough. Using a rolling pin, roll dough until it is an even layer. Using a cookie cutter or mason jar lid, cut cookies out of dough and place on prepared baking sheets. Continue to re-roll dough and cut cookies out until all dough has been used up. Bake cookies one baking sheet at a time for 25 minutes. Line a plate or baking sheet with parchment or wax paper. Using double boiler method on stovetop, melt chocolate ingredients over medium low heat. Stirring occasionally until ingredients are fully combined. Transfer chocolate to shallow bowl. Using a fork, dip cookies into melted chocolate, flipping as necessary so as to evenly coat both sides of cookie. Transfer chocolate-coated cookie to prepared plate. 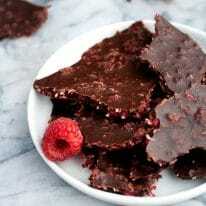 Refrigerate cookies until chocolate hardens, about 30 minutes, or freeze for 10 minutes. I’m about to make these cookies but I don’t have cocoa butter. Can I just use Lily’s choco chips and coconut oil? How much should I use? Unfortunately, I’m not sure what amounts those ingredients would sub in for cocoa butter, but you could absolutely try it! I just wouldn’t really be able to give an accurate guess as subbing in pre-made chocolate chips and coconut oil for an entirely different ingredient is basically a different recipe altogether. Chocolate came out extremely runny. The chocolate is sitting at the bottom of the bowl not mixed. Sorry you had trouble, Devin! Did you use cocoa butter (very different from traditional butter and coconut oil!)? I can’t imagine the coating being too runny if you used cocoa butter and cocoa powder, but if you did, let me know and I’ll troubleshoot some ideas with you! These are divine! 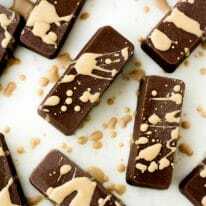 Love recipes that give me the sweetness but not all the guilt! I am so glad you enjoyed, Kylee!!! Thank you for your comment and recipe rating! I appreciate it so much! I tried this recipe and used egg. The cookies were good but were chewy and not crispy. Wondering if I did something wrong or if that is how yours turned out too? Hi, Ariel! I would guess that the cookies needed to be rolled out thinner. The dough has to be quite flat to achieve a crispy texture. I don’t have the monk fruit sweetener do you know if stevia could be substituted? If yes how much? Hi, Therese! Since there is such a variety of sweetness in terms of brands of stevia, it’s hard to say. I would refer to the packaging to see if they list a substitution ratio (the brand website may also have that information). Otherwise, I’d recommend just getting the monk fruit sweetener, or even Swerve or Truvia (1:1 subs for those).